These completely sugar-free treats with satisfy your sweet tooth without guilt! Peanut-free, gluten-free, sugar-free--and totally delicious. Just 75 calories each! These completely sugar-free treats with satisfy your sweet tooth without guilt! Peanut-free, gluten-free, sugar-free--and totally delicious. Just 75 calories each! Do not double or triple this recipe in a single batch--the food processor usually won't be able to mix much more than this amount successfully. To make more, it's best to make additional, separate batches. Pulse on/off for several rounds, approximately 30 seconds. When thoroughly combined and "sticky," remove from processor. 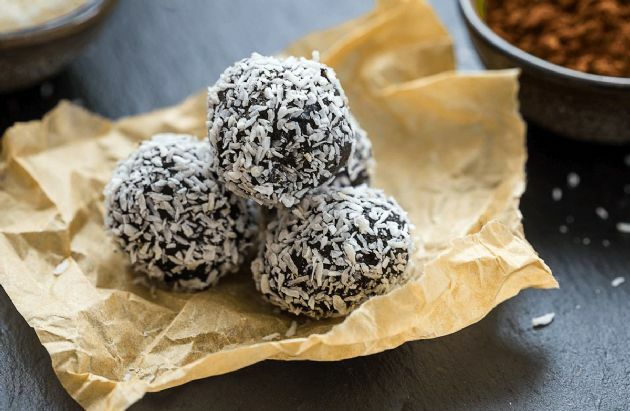 Roll into 1-inch balls and then roll through unsweetened coconut. That is naturally occurring fruit sugar, not added sugar. Yes, coconut is included in the calories. It only adds 6 calories per ball. Low carb snacks and apps.